I wrote another new post at the floating sheep blog. The post outlines some regional inequalities in geodata uploaded to Google (i.e. placemarks). China offers one of the most interesting examples. 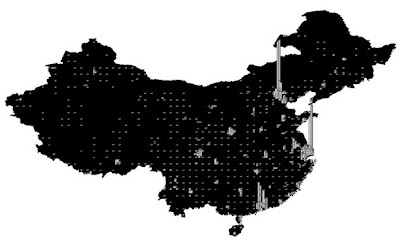 Beijing, Shanghai, and the Perl River Delta Region all are characterized by heavy information densities. In other words, a lot of information has been created and uploaded about these places. However, much of the rest of the country has very little cyber-presence within the Google Geoweb. In the map below, the height of each bar is an indicator the number of placemarks in each location. For the full post and more maps, head over here.